Firstly, I apologize for the lack of posts. It’s rare for me to be able to sit down and collect my thoughts lately, it’s always go-go-go and the day is always over before I know it. For those that don’t know, I’m a work-at-home mom and I own a greeting card company. It’s my hobby turned passion and I now work on the business full-time. I live with my husband and two-year-old daughter in Toronto’s east end. As a small business, it has been very challenging to get my company’s name out into the world, so I graciously take all the help I can get. Word of mouth is incredibly powerful, and while it takes little to no effort to share and pass on something you like, there is one vital step that is crucial we small businesses depend on — crediting. I rely on people to link back to queenie’s cards’ website or any online presence to keep spreading the word about my work. Without crediting, that photo shared on social media gets lost and without knowing, it’s out of your hands and other people are taking the credit — that credit is countless hours of hard work, endless efforts of self-promoting, long days selling at shows, sleepless nights of creating inventory, and wasted family time that should not be spent writing a blog post about other people taking work that is not theirs. 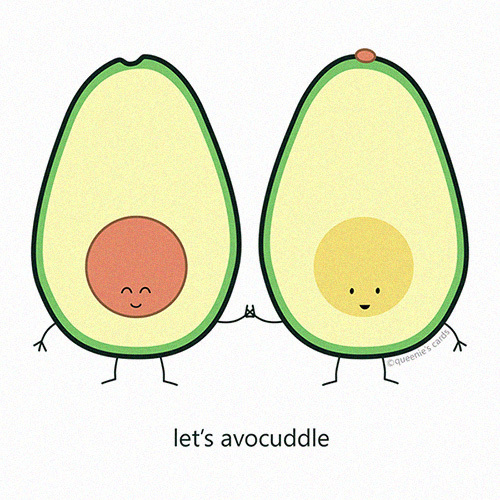 “let’s avocuddle” is a greeting card I created last fall (2014). I assure you, every single piece of work I release is from my own ideation. I have drawings and taglines that are similar to others, such as “thanks a latte” or “you’re a gem” — but puns are a funny thing, it is entirely possible for someone else on the other side of the world, or even down the street, to have come up with the same idea. The originality is in the design, and this below, is MY design, under my company name, queenie’s cards. The owner/author of a new original work secures the copyright the moment he or she creates the work. This means I automatically own the copyright of my work the millisecond I put my pencil to paper when creating new drawings. Watermarking is a choice and I did have watermarks in my early work, but I decided to remove it because I valued the customer experience when browsing through my online shop. I find them distracting and some customers thought the watermark was a part of the design which deterred them from purchasing my products. So, without giving it too much thought, I kept my images clean, for my customers, what you see is what you get. 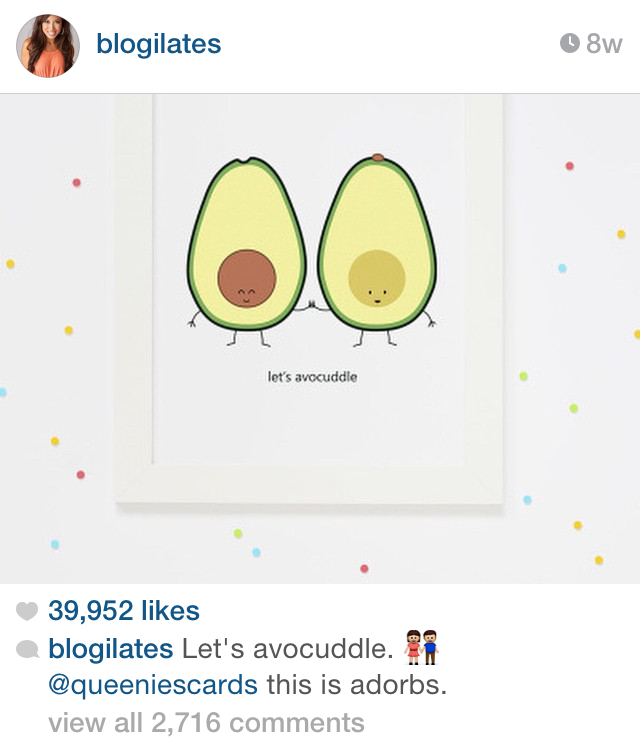 It wasn’t until last month when Instagram took my avocuddle cartoon to a new level — it went viral. 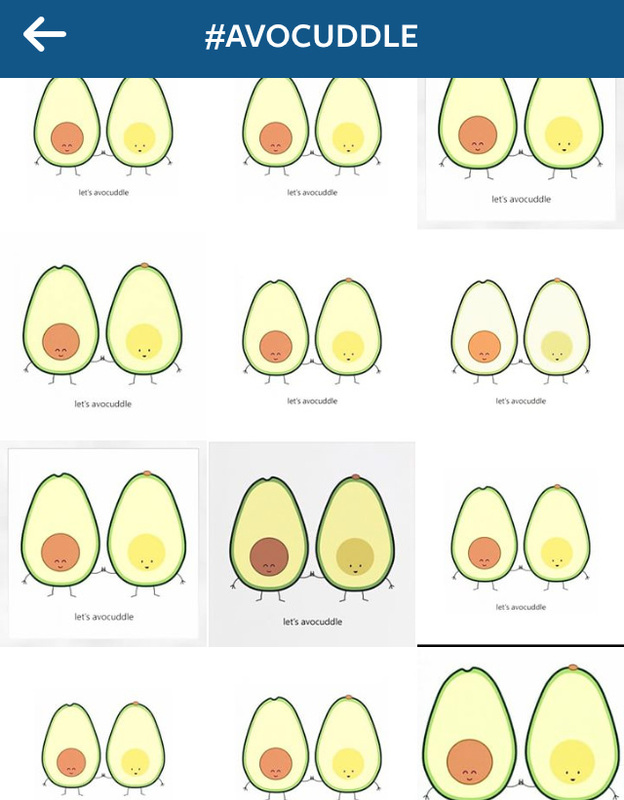 With a combined 60,000 likes and counting, seen by over 120,000 Instagram account holders, this avocuddle cartoon has become quite the phenomenon! It’s amazing, unbelievable, and utterly flattering! But… not everyone knows I am the creator. 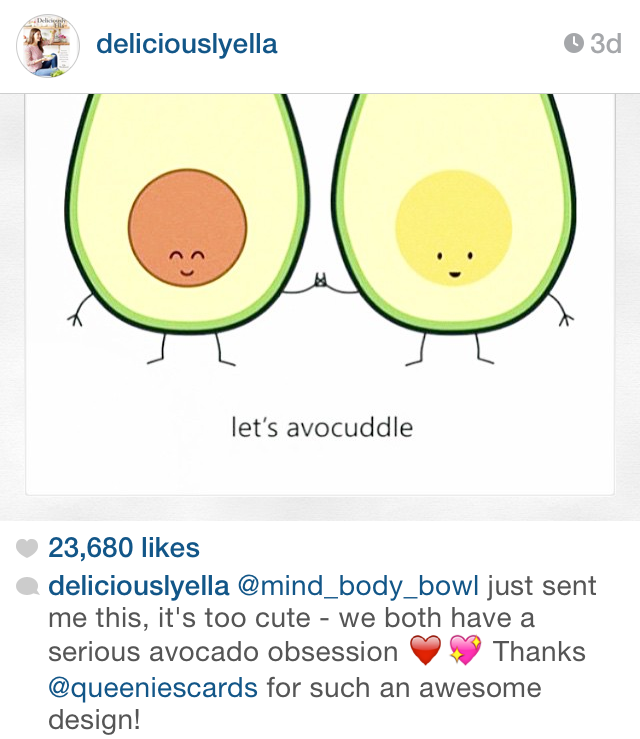 When you repost anything that isn’t yours, please know that is using someone else’s work without permission. I absolutely want you to share my images, but I depend on a mention, a tag, anything, to let others know how they can find my original work — which happens to be fun things such as greeting cards, art prints, magnets, tote bags, onesies and more! Maybe that someone who saw your post would even make a purchase, and supporting small businesses means that money will be put back into my neighbourhood through other local shops, children’s programs, and community events. I am absolutely not blaming anyone who has reposted my image without crediting, because I am fully aware you may not have known. But I do ask that if I contacted you in any way, with a reply/comment, an email, anything, please take a few seconds to add my name to your description, or tag my account (@ queeniescards). My friends, family and loyal customers have been trying to do the same, searching for hashtags, commenting, tagging, emailing… and I am forever grateful for such a mindblowing support system for my little company. I would not be able to do what I love, to see my dream into reality, without all of you. I genuinely thank you all for your devoted efforts — it’s worked twice! (Yes, can you believe this has happened twice already?). P.S. You can purchase the greeting card here, and the art print here! CLICK TO SAVE & SHARE!